Chef de cuisine to dukes, cardinals, marquises, and a regent François Massialot inspired professional chefs not only in France but in as well, especially when his Nouveau cuisinier royal et bourgeois was first published in 1691. Expanded into three volumes by 1734, the English version—The Court and Country Cook—was printed in numerous editions from 1702 until the mid-1750s. 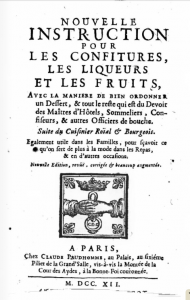 Massialot’s lesser cookbook Nouvelle instruction pour les confitures, les liqueurs et les fruits fist appeared in 1692 as an anonymous edition published in Paris by Charles de Sercy. Brimming with recipes for liqueurs, eaux-de-vie, espirit de vin, ratafias, distilled botanical waters, and hypocras, this volume is another inspiration for bartenders aspiring to create new ingredients.